Summary: ENHANCED severe weather threat for midday Monday as storms start pushing in mid morning to early afternoon. The Storm Prediction Center has placed us under an ENHANCED category for severe weather for Monday 7am through Tuesday 7am. The ENHANCED category for severe weather (a 3 on a scale from 0-5) comes with it a 30% chance of seeing severe weather (winds 58mph or greater, hail 1 inch in diameter or greater, and/or a tornado) within 25 miles of a point (red area below). 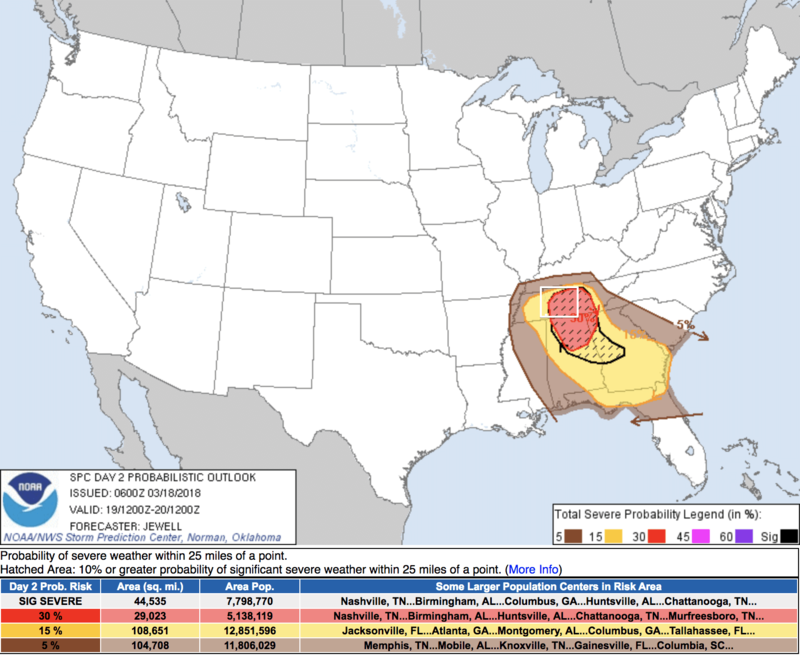 The SPC has also put a “hatched” area (the black circle with hatches inside in the above picture) over much of the ENHANCED area, indicating a 10% or greater chances of seeing significant severe weather within 25 miles of a point. SPC’s definition of significant severe weather includes winds 75mph+, hail 2 inch in diameter or greater, and/or a tornado of EF2 strength or greater. Important note: just because damaging winds, hail, and tornados are in the outlook doesn’t mean we will get all three. We may get one, two, all three, or none. 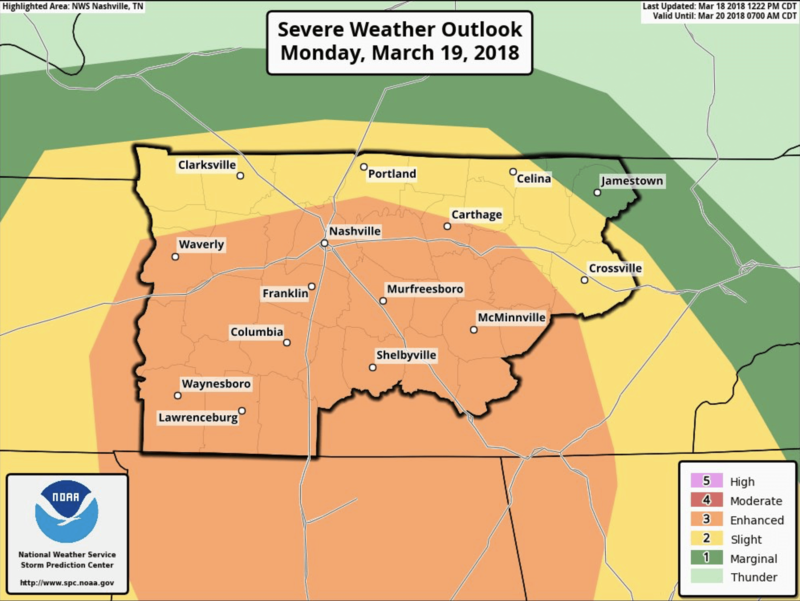 Tornadoes, damaging winds and hail are expected across parts of Middle Tennessee, much of northern Alabama, far northeast Mississippi and northwest Georgia. A strong tornado or two is possible during the late afternoon. Severe wind gusts are also possible into northern Florida. The shear should be favorable for supercell formation especially from middle Tennessee southward into north-central Alabama where hailstones of greater than 2 inches in diameter, wind damage and a tornado threat will be possible. A strong tornado may occur with any supercell that can become dominant. Let’s break this down just a bit. 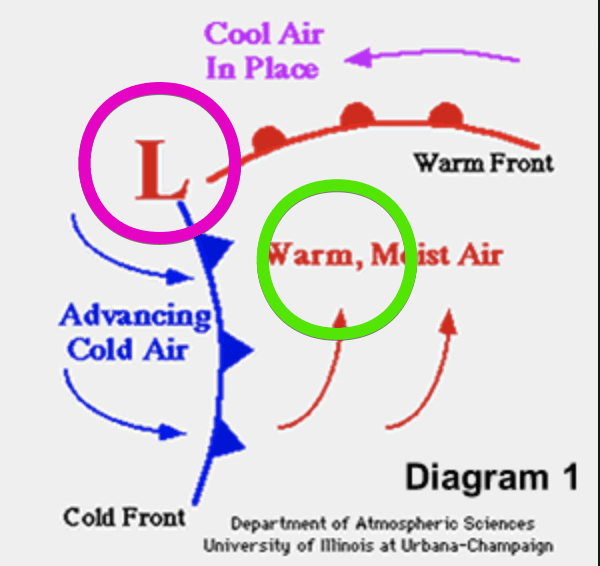 “Wind shear” is a fancy way of saying the change in wind speed or direction over a short distance. In this case, the SPC believes the wind shear, or change in wind speed and direction is favorable for supercell formation. This often means that there’s enough wind speed and change in wind direction to “stir up” a thunderstorm and cause it to rapidly strengthen into a supercell. We’ll have enough severe weather making ingredients (i.e. CAPE aka instability, wind shear, and an incoming front) to make supercells a possibility. When the supercells get going, they have the potential to be strong enough to drop 2 inch diameter hail (lime size, or just a bit bigger than golfball size hail), so take precautions and protect valuables you don’t want dinged up by hail stones falling with speed from the sky. With supercells in the type of environment we’ll have tomorrow, they could get strong enough to produce a few tornados, with the potential for one or two of those to be strong EF2 or greater tornados. A quick note about supercells: Supercells are severe storms that are typically a bit larger than a fairly average large TN city (think Dickson. They don’t always produce tornados or damaging winds or even hail. Sometimes they just throw lightning around, other times they are angry and put down large hail, send things flying through the wind, and could even cause a tornado spinup. 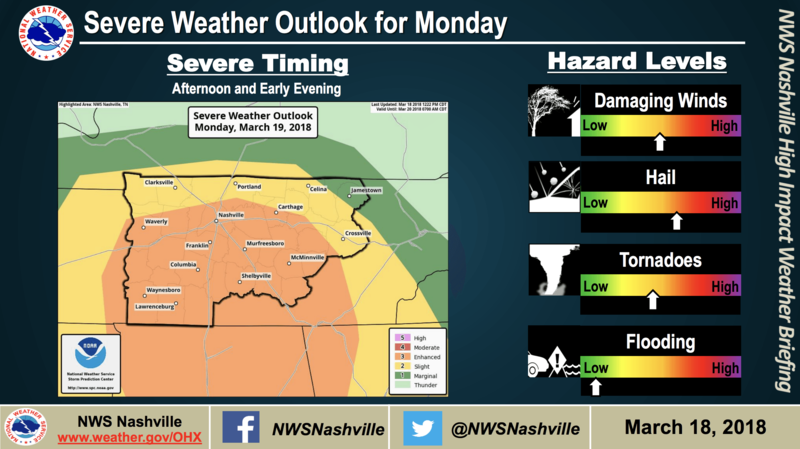 Our local NWSNashville has put out the following graphic on timing of Monday’s severe weather. We are expected to see the storms first, between roughly 1pm and 5pm. As models and forecasts are edited, this timing could change, so pay attention to future updates and forecasts for those changes. 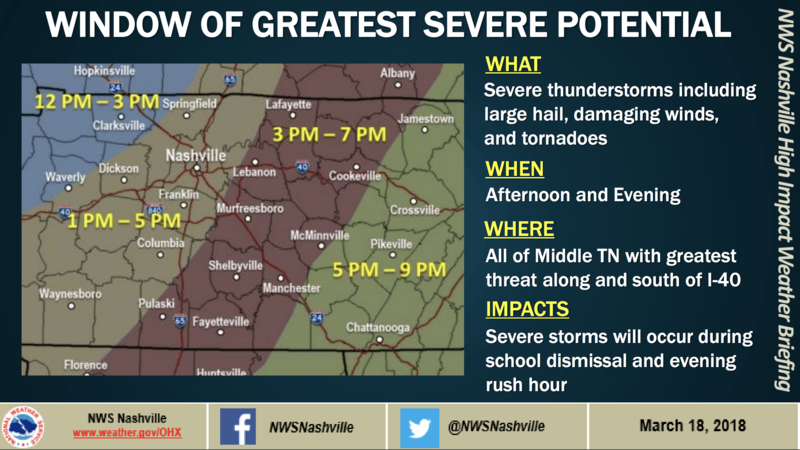 NWSNashville has outlined our risks as hail, damaging winds, tornadoes, and a flood threat, in that order. The below graphic outlines our risks for this particular severe weather event. Chances are good that this could end up being a primarily wind and hail event and less of a tornado event. For a good tornado environment, we would need to be in the bottom right quarter of a low pressure center, or the green circle below. On Monday, we are expected to have the low pressure center move right over us, or the pink circle. If the low pressure center moves more north than currently expected, then our chances of seeing tornadoes starts increasing more than currently forecasted. If it tracks south than currently forecasted, then our chances of seeing tornadoes starts to decrease more currently forecasted. 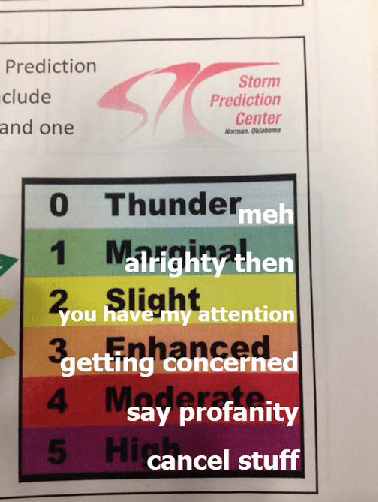 Note: The position of the low pressure center alone will not dictate a decrease or increase of severe weather expected, but may change the *types* and *strength* of the severe weather expected. This is the second ENHANCED category severe weather day we’ve had this year, but it’s always great to go over severe weather preparedness. Read up on what to do when severe weather is forecasted here. Always have multiple ways to get weather alerts and your weather info. 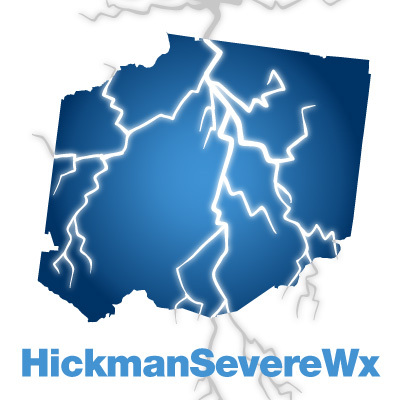 Follow me @HickmanSevereWx on Twitter, but also have another source of info (at any time I could lose power, lose internet, be put in Twitter jail for tweeting too much, or have to take cover myself). The chance for damaging winds and large hail is great tomorrow, so be sure to cover and protect any of your outdoor belongings that you care about, garage your car(s) if possible and desired, and definitely make sure your outdoor pets and animals have shelter or are sheltered. Tie down any outdoor furniture so that the winds don’t carry it over to your neighbor’s house.